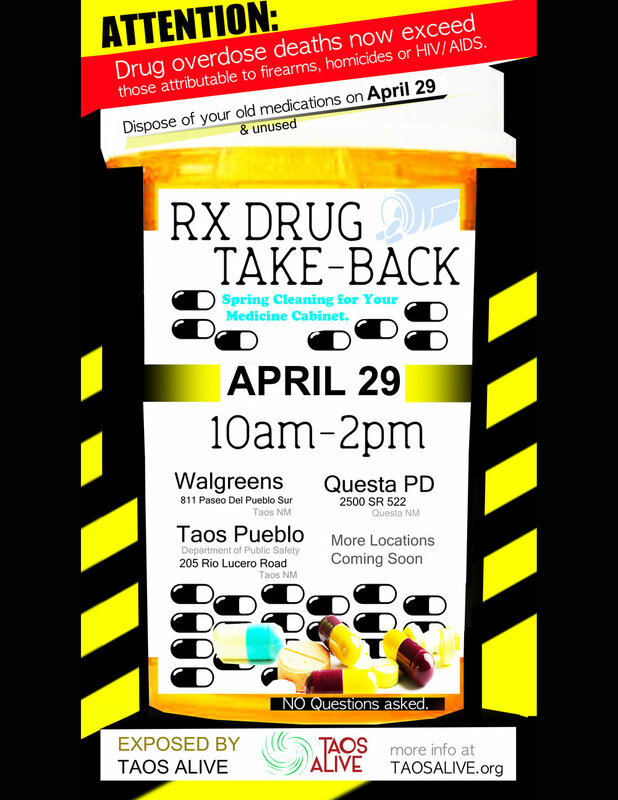 On April 29, 2017 from 10 a.m. to 2 p.m. TAOS ALIVE and the Drug Enforcement Administration (DEA) will give the public the opportunity to prevent pill abuse and theft by ridding their homes of potentially dangerous expired, unused, and unwanted prescription drugs. Bring your pills for disposal to WALGREENS at 811 Paseo Del Pueblo Sur, Taos, NM 87571. (The DEA cannot accept liquids or needles or sharps, only pills or patches.) The service is free and anonymous, no questions asked. For more information about the disposal of prescription drugs or about the April 30 Take Back Day event, go to the DEA Diversion website or visit TaosAlive.org for more information.